Ok, people, time to confess! A Hearty Thanks to Local Blogs! Thanks go to Art Pedroza of the popular and controversial Orange County Blog, Orange Juice, for including it in his Fire Round-up on the 25th. Thanks also go to Geoff West, of A Bubbling Cauldron, for including it in his fire round-up, also on the 25th, which has a spectacular photo. 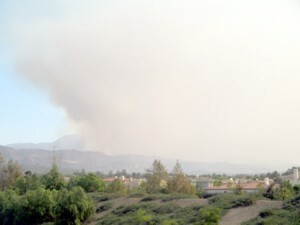 The weather has become cloudy and cooler, with an offshore breeze blowing the smoke into Riverside County to the east. 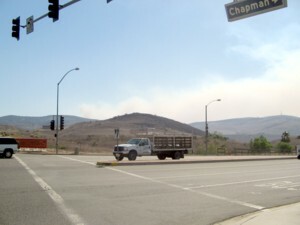 Health officials have kept health advisories up mostly for south county and areas close to the fires, advising that people with certain health conditions not do strenuous outdoor activities. Most High School Football games were canceled until Monday and at least one cycling club, the OC Wheelmen, has switched the location of its sunday rides to flat riding along the coast, as opposed to the planned inland and hilly routes. It appears that many cyclists are going to be getting back in the saddle today all across north county and along the coast, based on the health advisories, and the fact that the sight and smell of smoke is no longer hanging over us. I'll toss the bike on the bus to work and ride it the 10 minutes needed to get to my late night bus home because to do otherwise will mean I get home 2 hours later. I'll return to longer riding on the 30th. Where there's Smoke, there's Fire: Should You Ride? This is not a simple question to answer, health risks or not. All hell has broken loose in SoCal, including here in Orange County, south of Santiago College in the Northern reaches of Irvine, all the way south to Foothill Ranch, and Cook's Corner. I hadn't rode my bike for a couple of weeks until Monday when I rode 4 miles for the sake of a new odometer, 17 miles on Tuesday to test the odometer and get pictures for a fire related story and 5 miles yesterday on my way to work. Did I have to do any of that riding? No. When you live in SoCal and have no car bicycling is one of your options for getting around, and like most folks the health risks never crossed my mind. 2 e-mails have served to focus me on the risks, however, and remind me that I should forget the bike for the duration and rely strictly on mass transit. I stupidly decided to ride my bike in the midst of wildfire smoke about three or four years ago. It's a bad idea -- don't do it if you can avoid it. lungs when I continued to bike in spite of smoke; the damage is permanent. As someone who has been involved with health and fitness for over 50 years I really want to encourage you to stay off the bike this weekend, unless you can ride it inside or at the gym. The longtime damage that you will do to yourself by riding outdoors this weekend will far out way the benefits. The medical authorities suggest you do not do outside physical activity for two weeks after the smoke clears. We cannot see the tiny particles being embedded in our lungs. Smoke effects include eye and respiratory tract irritation, reduced lung function, asthma, coughing and excess mucus. I urge you as a friend and as an avid cyclist that you do not ride your bike outside this weekend. The OC Wheelmen have postponed the fall metric because of the smoke. Cheers to that decision. It’s hard for me to believe that there are any scheduled rides for this weekend by anyone. Again, I plead with you to take care of yourself by just relaxing and enjoying your life. PS : Share this with anyone you care about. I'm convinced and have always used Mass Transit to help me get around, but it's not that simple for other people. In SoCal there are many people whose only source of transportation, for getting to and from work, or just going anywhere, any time, is by bicycle. I'm not just talking about illegal Hispanics and Hispanic citizens of low income, either, though they no doubt constitute many such people. You will see them during the day, some congregating on street corners and at work centers, riding for miles day and night to get to where they need to go. Many people who ride their bikes may not be able to afford a bus pass and even if they could maybe the bus doesn't go to, or near, where they need to go, much less at the times they need the ride. Many people don't have time to read the paper, or watch TV and may not own a computer, so will not learn that they maybe should not be riding their bike anywhere. Many may not even read, or speak English. When you need to pay the bills and feed the family you get things done using the transportation options available to you, risks be damned. There is a continuing Health Alert In LA County, Orange County, San Bernardino County (and for child safety, here. ), and San Diego County. Due to the numerous wild fires burning throughout San Diego County, localized areas of smoke and ash have occurred in many areas. As a result elevated particulate matter concentrations, including fine particulates, or PM2.5 concentrations, may reach unhealthful levels in some smoke impacted areas. In areas of heavy smoke, assume that air quality levels are unhealthy for sensitive groups to unhealthy for all individuals. In areas with minor smoke impacts, assume that air quality levels range from moderate to unhealthy for sensitive groups. In areas where you smell smoke it is advised that you limit physical activity. If possible, stay indoors to limit your exposure to fine particulate matter. 1. What's in smoke from a wildfire? 2. Is smoke bad for me? 3. How does smoke harm my health? 4. How do I know if I'm being affected? 5. What can I do to protect myself from wildfire smoke? 6. Do air filters help? 7. Do dust masks help? 8. Are the effects of smoke permanent? Please read the whole page and if you live in affected areas do what you can to spread this info around to those you know and care about. Health Threat From Wildfire Smoke: A fact Page. Websites for Currently Affected Areas in California. The American Lung Association: Forest Fires and Respiratory Health Fact Sheet. A special Tip of the Hat to Gene Bisbee, of Biking Bis, who inspired me with his post from August when wildfires hit Montana, Idaho and Washington. Ok, call me daffy, but I used the excuse of giving my new odometer its first true workout, yesterday, to get a look at the fires in Irvine from the safe distance of the Mountains to Sea Trail. 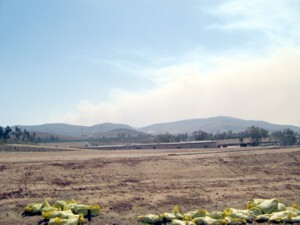 The first 10 miles of the trail come within a few short miles of the 2 hot spots on the northern end of the huge area covered by the fire, and I saw just how close a portion of the trail and the housing developments, and a regional park, to the north of it came to being engulfed by fire over the weekend. On Monday I rode my bike to the REI in Huntington Beach and arriving with a flat back tire went inside to get an odometer. I wish to thank Steve Kennedy, in the cycling dept., for his assistance with the flat and the selection and installation of the Sigma BC 1106 DTS odometer. Yesterday I rode the OCTA 54 bus on Chapman, to Santiago College at Jamboree and the start of the bike trail. My bike ride lasted only an hour and I took 5 pictures. Look at the map from the OC Register: My 1st 3 pictures, all related to the fire, show not just how close the fire came to the trail and housing on Jamboree, but how far away the rest of the trail is from the action. The truly sad thing to report is how the beauty of one of the premier bike rides of the county will be affected by the ravages of the fire, including the very real risk to the popular Cook's Corner diner at the southern end of the route. Riding along Santiago Canyon Rd., from Jamboree to Cook's Corner and back, or continuing along El Toro Rd. to the coast or connecting with the Aliso Creek Bike Trail to its end and THEN returning, is a popular way to spend the day cycling. It is something I still plan to do. My first photo takes in the northern most active part of the fire, south of the Santiago College, from Chapman and Jamboree. My 2nd photo is on the trail as it parallels Jamboree and passes the northern most tip of the fire damage, east of Tustin Ranch Rd.. Behind me are expensive housing developements and a Regional Wilderness Park just up the road. 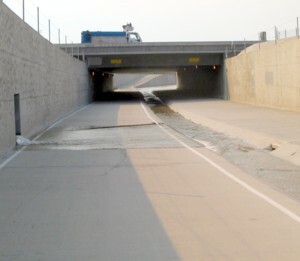 The bike trail eventually leaves Jamboree, and heads between housing tracts to parallel the 261 Toll Rd. for a while and my 3rd photo is taken from the vantage point of Bryan Rd. as the trail crosses over the Toll Rd. from the west side to the east side before continuing on its way. This offered a spectacular view of the other northern hot spot, above Portola Pkwy..
As I continued on my way I enjoyed the peace and beauty that is part of the fun of this entire route. There is one stretch where the trail gets up close and personal with the channel itself, below the I-5, and I came across a release of water, from somewhere, that required careful navigation to get past. 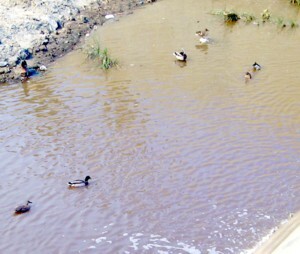 Matching picture 4 above, on the other side of the tunnel I came across some local residents bathing themselves in the cool, refreshing, water. I left the trail at Walnut, rode west to Red Hill and caught the bus to work. I rode a total of 17 miles over the whole day and absolutely loved the way my new odometer performed. Portions of 7 counties are on fire, some worse than others, including the same area of Malibu that I rode this summer and took pictures of. 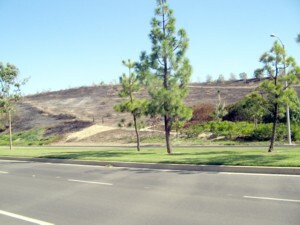 I live about 8 miles from where the fire is raging in Irvine, dangerously close to the Mountains to the Sea Trail that I have blogged about (With pictures!) in the past. San Diego has gotten the worst of things, and one BikeBlogger took some pictures on his ride to work today. As you no doubt have heard, we are having a little problem with fire in San Diego county. I, of course, rode the bike to work today. Actually, it wasn't bad, just a bit irritating to the eye and throat. A pleasant smell of burning wood. Except it wasn't a fireplace, it was the WHOLE EAST COUNTY!!! AGAIN! Sometimes my writing gets its inspiration from the most interesting places. A cyclist gave police a false name after he was seen riding on a pavement. Nicholas Skinner (19) was seen cycling on a pavement in Westlode Street, Spalding, by police on the afternoon of June 14. He rode between parked vehicles and onto the correct side of the street after officers shouted at him to get off the pavement and was later seen parking his bike outside Maples Solicitors. Spalding magistrates heard on Tuesday that Skinner told the officer his name was Gareth Searle before his real identity was revealed by another officer. Skinner, of London Road, Spalding, was charged with failing to give his name to an officer and riding a cycle on the footpath but did not respond to the court summons. He was also facing a charge of failing to comply with a red light but this was withdrawn. Magistrates fined the guy more (£60) for not giving his name and address than for riding on a path (£40)! He was also ordered to pay costs of £60 and a victim surcharge of £15. Now, I ask you, was it worth it to ride on the sidewalk, and risk getting caught? From Spalding Today, and Lincolnshire Free Press - 10/16: Cyclist gave false name after riding on pavement. So what was the first thing that runs through my twisted little brain? You know the one, even if you don't know all the words. Whatcha gonna do when the cops come for you. Tell me, where ya gonna ride, whatcha gonna do? Yeahhh? Why did you have to ride where it's not so keen? I know sometimes - you want to just go, wohh! Another artist who bicycles, and whose art often features cycling, has come to my attention. The 1st thing you see when visiting the cool looking Home page of his website is a map to the site in the form of a route marked on a map! Oh and these words: Painting that celebrates the spirit of cycle sport and the portraits of those who ride. His Bio made me laugh as he reveals that he is from Wales and grew up racing sheep up green mountains, on a bicycle, and this drove him to flee the lovely British Isles for the relative sanity of Brooklyn where he now races over potholes and pedals long distances to get a glimpse of countryside. His paintings are way beyond my budget, but are wonderful to look at, as are his drawings, and sketches. For those interested he will do works "through commission, whether it’s a celebration of your own passion, a gift for a loved one, a memento for a teammate or a corporate display." NYC Velo is a different kind of bike shop, a shop owned and staffed by cyclists, for cyclists. NYC Velo has the only bike lounge in Manhattan where cyclists can hang out, read a magazine and take in some art. NYC Velo will be showing a collection of my paintings for the month of October. Please pay them a visit, view my work and ofcourse browse the store. My thanks to Andy Crooks and his team. I checked out the shop website, and it is a great resource, information-wise, for cyclists in New York. Steve's Website, Velopaint, is here. His new Blog, Velopaint Blog, "will be a way of sharing the stages of a work in progress, ideas for future pieces and any news relevant to Velopaint", and is here. What's in a Name, and a Relationship? The two Biketown bikes live next to each other in the garage. Their relationship seems a happy one. But... there was something missing. One of the things missing was a name, since "He" had one, and "She" did not. There's more to the story, and you can read it at Coasting, in a story called Introducing Eileen. Wonder what happened to the Russian? Beginning in August of 2006, a Russian cyclist began a BikeBlog in Russian, and it had frequent posts every month thru January, then 1 in Febuary.